Update on Biden Beach Boardwalk Bash: A party for the Vice-president’s friends in the media. 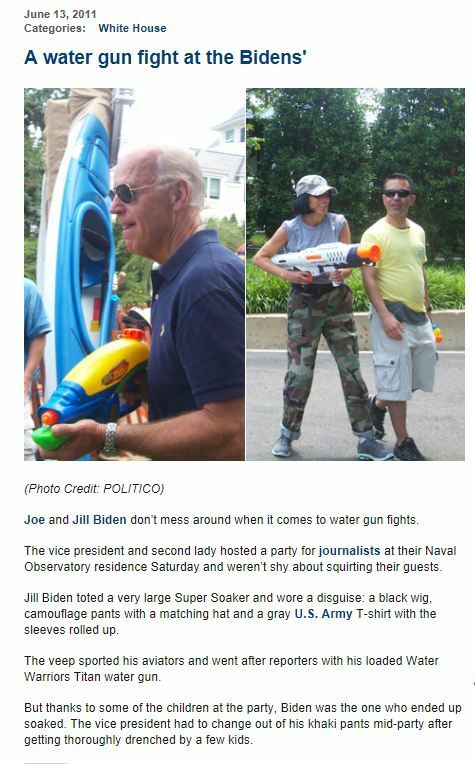 JJChronicles.com obtained the list of journalists who attended Vice-president Joseph Biden’s summer water gun fight “the Biden Beach Boardwalk Bash”. According to the White House, among those who attended were Chuck Todd, Savannah Guthrie, Wolf Blitzer, Gloria Borger, Ann Compton, Claire Shipman, Bob Schieffer, Norah O’Donnell, Chris Matthews, Suzanne Malveaux, and Rachel Maddow. In addition to the reporters and news show hosts that attended, producers from the major networks also attended. Including the executive producers for both Face the Nation and Meet the Press. 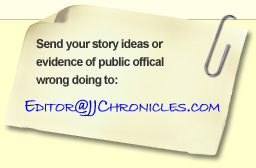 JJChronicles.com was able to find only one Fox News employee as participating and that was Ed Henry. It is unclear if he was at Fox News when he received the invite or at CNN. The party was held on June 11, 2011 and the announcement Henry was moving from CNN to Fox News on June 20, 2011. Many of these reporters took children and spouses to the party further compromising their independence and objectivity. Broadcast journalists were not the only ways to violate the Society of Professional Journalists recommended ethical standards. Reporters from the Los Angeles Times, Washington Post, New York Times and web-based media outlets also attended. Repeated attempts to get the cost of the party and the names on the invitees failed. Thus far, JJChronicles has not been able to find any other Fox employee who attended the party, but work to find those who attended continues. Without the invite list, JJChronicles cannot determine if the vice-president simply did not invite Fox News employees or those invited employees decided not to attend. If Fox News employees are not on the list, it would further appear that the invite is a reward for favorable coverage. The journalist who attended this party are among the most well-known in the nation, but they appear to have violated ethics standards recommended by the Society for professional Journalist. Attending such a party without disclosing it and for reasons other than news coverage clearly violates several provisions of the “Act Independently” section of the ethics policy. Earlier this week, the vice president released several photographs of the event. Photographs JJChronicles requested months ago and was denied receipt. MSNBC reported the party but again made no mention that many of its journalists attended the event. On June 13, 2011, POLITICO ran a five-paragraph story describing a party hosted for journalists and their families by the vice president and second lady at the Naval Observatory. The POLITICO story stated the vice president and second lady “weren’t shy about squirting their guests.” They are shy about disclosing the names of those guests. In a classic case of junk journalism, the POLITICO did not name any of the guests and provided no caption below a picture showing two participants. It did not identify the two visible people. POLITICO’s favorite junk journalist ploy, the use of anonymous sources, goes a step further, anonymous subjects. Jonathan Martin, the POLITICO reporter who accused Republican candidate Herman Cain of misconduct using anonymous sources attended the party but was not identified in the POLITICO story about the party. The week of the party JJChronicles.com requested a list of the attendees from the vice president’s media office. The vice-president’s office ignored the request. The vice-president’s staff treated subsequent requests with disdain and arrogance. Not once did the vice-president’s media staff direct JJChronicles to the website where the names were release in late August. As of this date, no media person has contacted JJChronicles.com. The media office employees claim they forwarded the request to the proper person. JJChronciles.com submitted a Freedom of Information Request soon after the party. On a September 20, 2011, the Department of Homeland Security responded confirming receipt of the request. Craig W. Ulmer, Special Agent In Charge, wrote “Due to the increasing number of FOIA requests received by this office, we may encounter some delay in processing your request.” Perhaps the increase in requests is the result of silly failures by White House staff. Ulmer appears unaware the White House published the names in August on its website. Ulmer also wrote, “If you have any questions or would like to discuss this matter, please contact this office…” JJChronicles attempted to make contact with Ulmer several times most recently on Jan. 6, 2012. In one phone call, Ulmer’s staff put the call on hold for 25 minutes and then hung up. In another call, Ulmer’s staff refused to identify herself stating “I do not wish to….” The staff member forwarded the call to a “supervisor” who did not return phone calls. President Obama’s administration must believe keeping the names of journalists who are in their pocket secret is essential to the administration. Otherwise, what is the secret? Why is a secret service special agent wasting staff time protecting the identities of journalists who attended a party? In February, JJChronicles received a letter stating the names of the journalists who attended the party could be found on a government website. The lack of disclosure by the administration is common. The administration routinely ignores the request for information. The administration does not respond to Freedom of Information Act requests. 1. JJChronicles.com requested the White House provide the cost of the President’s and First Lady’s date night. The administration never released putting the request into a perpetual review. 2. Requested the Justice Department give information on the legal basis for reading Miranda warnings to terrorist and foreign combatants. Justice reported that there was no information on how it came to the conclusion. They noted there were many emails but refused to provide them. The FBI did provide a copy of the modified Miranda warning agents read to terrorist and foreign combatants. Apparently, the legal theory behind making Miranda apply to foreign fighters is a secret. 3. Requested information on the number foreign combatants who actually received their Miranda warning at the time of capture and prior to being questioned. JJChronicles.com believes this is a key element to any potential trial in civilian courts on U.S. soil. Justice claims not to have that information. Justice refuses to explain how information obtained prior to the Miranda warning can be used in civilian courts. 4. Requested statistical information on the number of illegal aliens filing taxes with Individual Taxpayer Identification Numbers, and the taxes paid by these filers for the years 2006 to present. Administration officials sought payment for that information and would not recognize web based news outlets as media. This was a complete departure from the Bush Administration which released the information without charge. When JJChronicles.com supplied the IRS with the presidential executive order stating the administration should strive to make it easier not more difficult to obtain information. The IRS official stated that presidential executive orders are not policy and have no weight. 5. Recently sought information from the President’s Council of Environmental Quality and after initial email communication, the council spokeswoman ignored subsequent emails. The National Environmental Protection Act (NEPA) requires federal agencies to review the potential environmental impact of policy changes. The president’s Council of Environmental Quality is the responsibility for ensuring the federal government complies with NEPA. JJChronicles.com believes the Department of Homeland Security has not complied with the requirements when changing deportation policies.